You know what I'm "Saiyan"? I've only ever been a casual fan of the Dragon Ball anime and never once read any of the manga pertaining to the long-running series. It's never been a franchise that sparked my interest to any large degree yet I've almost always checked out the story-based games like the Xenoverse series and even as far back as Dragon Ball Z: Sagas on the PlayStation 2 way back in 2005. When it was announced that Arc System Works, developers of the gorgeous Guilty Gear and BlazBlue series, were tasked with creating a fighting game based on the beloved series, It felt like a match made in heaven, and for the most part, it very much is. Both current gen iterations of Guilty Gear and BlazBlue look and play like a big production animated feature despite each character being modeled in 3D. Arc System Works ability to make a 3D model look like a high definition 2D sprite is truly an impressive achievement and Dragon Ball is a franchise that works so perfect with this style that I'm surprised it hasn't happened sooner. The Dragon Ball series has a wide cast of characters to choose from and while the game doesn't feature the largest ensemble of fighters featured in a Dragon Ball fighting game, it does feature a varied selection of series favorites that refrain from feeling like pallet swaps of one another. 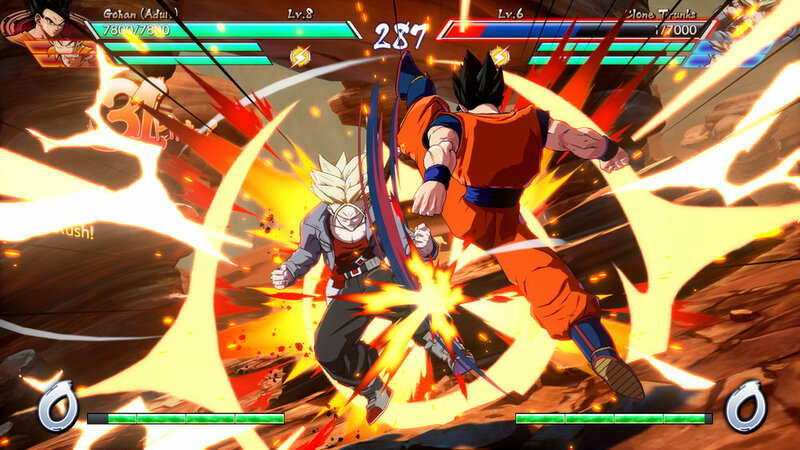 Combine the fact that you can play in either English or Japanese voiceovers, allows Dragon Ball FighterZ to satisfy all fans of the anime, no matter your stance on dubbed or subtitles. 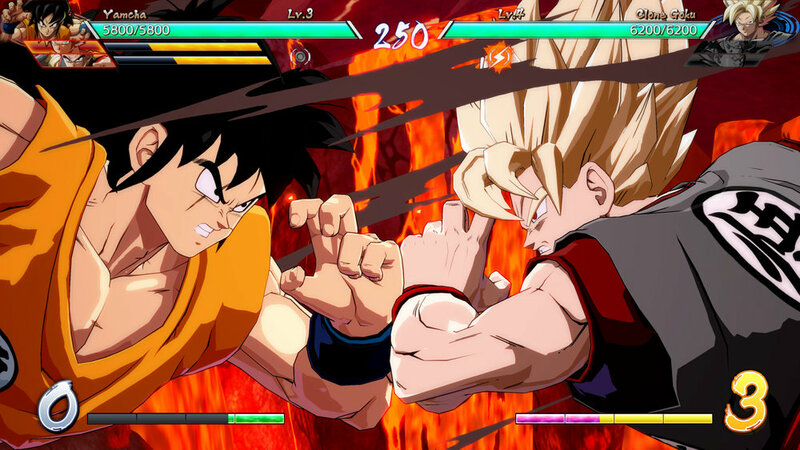 Dragon Ball FighterZ features a full-length story mode that sees multiple heroes and villains coming together to take on an evil the likes the series has never seen. The story mode consists of three campaigns that retread portions of the same story albeit through different perspectives and some entirely new moments. The first two campaigns play fairly similar to one another, whereas the third campaign definitely feels the lightest in terms of actual story. While the story elements are fairly satisfying, the enemies you battle throughout the 18-20 hour campaign are painfully bland. Your main antagonist is Android 21, a villain who has an insatiable hunger for power and surprisingly looks identical to my Xenoverse 2 created character. Apart from the few battles with 21, you are mostly tasked with taking out clone after clone of the entire central cast. While these hundreds of clone battles will swap up the combinations of clones in each encounter it still feels like you are taking part in the same battles again and again. It is very easy to get fatigued and lose interest in progressing through the story, and that should never be the case. As you unlock new fighters during the story mode, each of them will have a scene remarking about how they have to fight themselves as they are face to face with their clone. These outspoken moments are as tiresome as Bulma having to explain certain story beats again and again. What does shake up the variety are the conversational bits between certain groups of fighters. These are vastly enjoyable and it keeps track of which ones you have found and which ones you have yet to witness. One aspect of the game that is pretty humorous is how certain gameplay mechanics like having to earn experience or how only one fighter can be present in battle at once are actually plot points written into the story and several characters actually comment on how ridiculous it all is. The cast of fighters consists of 24 playable characters with 8 prepped for DLC at a later date. The first campaign will see you mostly using characters like Goku, Krillin, Piccolo, Gotenks, Vegeta, and Yamcha, The second campaign is more villain based as you'll control Frieza, Ginyu, Nappa, and Perfect Cell. Lastly, you have characters like Android 16, Android 18, Hit, Beerus, Trunks, and a few more to round out the small cast. As you battle you will earn experience and level up. You can also add modifiers like extra health, better experience earns or amplifying your health or defense. While some matches will be incredibly easy, some battles will make you rage at how drastic the difficulty can spike in the later stages of the second campaign. This can mostly be solved by retreating back to a former stage and grinding enemies to level up. The campaign plays out via a game board with certain paths leading you to certain enemies and special encounters seeing you rescue and recruit more fighters to your team. As you move around the board you will tick away at a timer of how many more movements you can make on the board. This timer feels unnecessary as you rarely ever come close to consuming all your available turns. While the game offers a decent assortment of fighters during each campaign, it can almost feel counterproductive to use most of them. If the general level of the board is level 22-24 and you have a set group of fighters at 21-23, by swapping to level up additional characters, you may end that board with an overall average of level 22 instead of sticking with one group and leveling them to 24-25. By the time you get to the next board and the average is 24-27, you can be woefully under-leveled because you chose to level up additional fighters. Because of this, I often stuck with a set group of three and only leveled up my additional fighters by loading up previous maps as your character levels will save regardless of story progress. The combat can feel very similar to that of the likes of Marvel vs. Capcom 3: Ultimate as you have three on three teams that can tag in and out or step in for a quick assist attack. While it would be extremely fun to keep spamming those assists, each character is granted a cool down after using their assist attack. Building your ideal team can add a wealth of depth to your playstyle as not all assist attacks are strikes, some can assist in close or mid-range damage where others can offer defensive assistance or healing properties like Krillin's Senzu Bean. Moves like Vanish attack, which causes your character to teleport behind your opponent, or your character's core special moves are all pulled from your Ki Guage, which operates like what you expect a meter at the bottom left to do in a fighting game. You will earn Ki doing various actions in combat or by pressing a few buttons to manually charge up your Ki, but keep in mind this technique leaves you wide open for damage or can be used as a tactic to lure enemies in. Other than your basic attacks and performing them to spam combo after combo, you can perform moves like the Dragon Rush which can either perform a mid-air combo or force your opponent to switch characters, pushing the more recent one out of the match, temporarily. The Super Dash can be a bit of pain to deal with as it can seek out your opponent and bypass most projectiles and close the gap between you and them. Lastly, are those very projectiles which are called Ki Blasts and these vary from fighter to fighter. Characters like Goku have your traditional power blasts where another character like Android 16 has missile arms that can partially track your opponent. Combat and the bombardment of flashy special attacks all look remarkably gorgeous and the camera can swap to some angles that make it look like it is ripped right out of the show. This is by far one of the best looking fighting games I've ever seen and rarely does the game disappoint visually. Backgrounds are wonderfully detailed and never cause you to lose track of your fighter as they don't fit the same 2D sprite look of the roster. You can hit characters so hard they slam into the side of a mountain or a building, and in the case the Arcade mode, you can hit them into another map entirely. Fans of the show will want to seek out the Dramatic Finishes as these scenes recreate certain battles from the show and require you to beat a specific character in a certain map. These scenes are visually stunning and are some of the only story scenes you can screen capture as all elements of the story mode do not allow screen captures or recording, other than using outside tools to rip footage. Apart from the story are a few competitive modes both offline and on. Arcade mode allows you to battle with access to the entire cast and take on match after match attempting to increase your overall fighter rank. It has a few options but is fairly limited in what it actually offers. You can take part in local battles with your friends or find a match against a player around the world. The online infrastructure feels slow and getting into a match can be as quick as a few seconds or as long as a few minutes, with results varying daily. The lag seemed very minimal apart from a few disconnects here and there. You can watch top-tier matches via the replay option or try out the tutorial to master a specific character. The overworld hub is a small recreation of a city center complete with the Kame House, which currently does nothing. This circular hub contains your story, arcade, and online modes and can appear to be quite enjoyable for a whole 2 or 3 minutes. Here you will run around as a chibi version of a Dragon Ball character and interact with each station. You can customize your avatar by unlocking other characters, skins, colors, and more. These are unlocked through Z Capsules which can be purchased with Zeni, the currency you earn through battle. Occasionally you will earn Premium Z Coins which will net you a random item you don't currently own. While I am sure that Arc System Works added this in to pack extra value into the game, it feels completely unnecessary and is something you will just bypass to access each of the varied modes. As good as Dragon Ball FighterZ looks, it does have several issues that do need to be mentioned. There are some walking and movement animations in the story cutscenes that are painfully awful and come off as robotic or slow. While the cutscenes can make it feel like you are watching a high-quality episode of the series, you have to keep pressing a button to proceed to the next delivered line of dialogue. This can really ruin the flow of a cutscene when you are wanting to sit back and experience it like a normal cutscene. The game also features a ton of connection prompts each time you start up the game and even more so when it is your first time playing. This game has a ton of menu's and prompts that easily could have been more simplified and made less intrusive. The Hub world feels entirely pointless and could have just been a simple menu with some nice character art as opposed to the bland and awkward overworld. Dragon Ball FighterZ is a gorgeous fighting adaptation of the beloved anime series. It looks and plays like a big budget animated production with some absolutely incredible character models that will put a smile on your face. The story mode has several moments that entertain, but its reliance on repetitive clone battles can make you burn out on the game entirely. The online and versus match offerings are solid and you can perfect each special move with the fairly decent tutorial mode. The combat is accessible to newcomers and deep enough for veterans of the genre. Arc System Works are a talented studio and this game backs that up in spades. Dragon Ball FighterZ is not without its problems, but the core element; the combat, is fun, it's fast, and it is everything Dragon Ball Z is. Until then, tune in next Dragon Ball. DEVELOPER - arc system works / PUBLISHER - bandai namco ent. dragon ball fighterz WAS PURCHASED BY THE REVIEWER.